Dwarf shrubs are among the most used of garden plants. Anyone doing landscaping or planting a foundation has a need for long-lived plants that won’t cover windows or too much of the house, or take over a small garden bed. 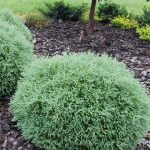 Many dwarf shrub varieties are available, more than can possibly be covered here. For the sake of brevity, here are varieties that are either new or a champion of the category. If you need more ideas, contact your local garden center where they will be glad to overwhelm you with possibilities! 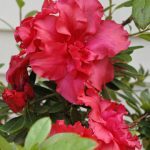 Azaleas, Re-blooming – What’s not to love about azaleas that bloom twice? Look for the Encore, ReBLOOM, and Bloom-A-Thon series, which collectively offer spring and fall blooms in a satisfying array of colors, most of which top out around 4-5 feet tall or smaller. Plant in part sun to light shade. ‘Crimson Fire’ Fringe Bush (Loropetalum) – Finally a dwarf loropetalum that may actually attain the long sought after height range of 2-3 feet tall and 3-4 feet wide. We were impressed with the very handsome and uniform habit of this new variety and glad to see it retain much of its deep burgundy leaf color through summer. Neon pink fringe flowers in spring add seasonal appeal to this evergreen. Grow in full to part sun. ‘Crown Jewel’ Gardenia – This extremely compact form is just 2-3 feet tall and 4-5 feet wide and makes for great low hedges and foundation plantings. The beautiful, double-form fragrant white flowers bloom in early summer. Other good dwarf choices include ‘Heaven Sent’ and ‘Jubilation’. Plant in full to part sun. ‘Free Spirit’ Michelia (Magnolia laevifolia ‘Free Spirit’) – We’re in love with this new variety, which is smothered in pristinely elegant and highly fragrant white blooms in mid to late spring. If you love Southern magnolia, sweet little ‘Free Spirit’ will charm the socks off you. Beautiful, semi-glossy jade-green foliage adds to the show and is evergreen. Grows to 2 feet tall and spreads to 6-8 feet wide. Plant in full sun to part shade. 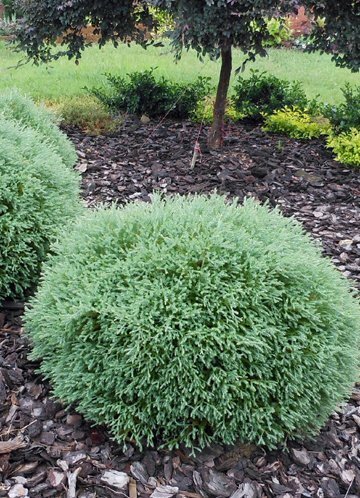 Globe Arborvitae (Thuja) – “Globe” is a general term for low, mounding forms of these evergreen cedars. Soft, feathery foliage and super-compact habits mean good looks and no pruning for the gardener. Great landscape performance means they are low maintenance. Some of our favorites included ‘Danica’, ‘Grune Kugel’, and ‘Mr. Bowling Ball’. These grow 1-2 feet tall and wide depending on variety. Plant in full to part sun. ‘Goshiki’ False Holly – This is not new but it’s also not widely known. Boasting spined, holly-like leaves spattered with light golden cream variegations, ‘Goshiki’ is a tough, evergreen plant. Its attractive, variegated foliage makes a nice foil for dark green and burgundy-leafed plants. Grows generally 3-4 feet tall, more with age but they are slow. Plant in full sun to light shade. 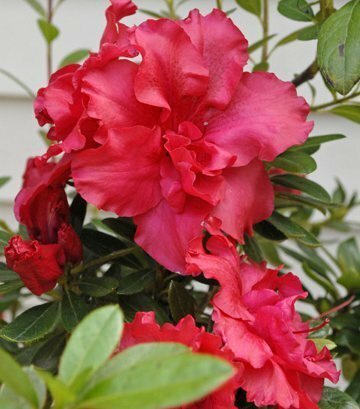 ‘Hot Flash’ Camellia – There are only a few varieties of dwarf camellia regularly available, generally dark or light pink. The new ‘Hot Flash’ variety adds to the mix with semi-double near-red flowers that have bright yellow stamens. An evergreen, it grows 3-4 feet tall and wide. Plant in part sun to light shade. ‘Little Heath’ Pieris – There are plenty of dwarf pieris varieties but this one is a personal favorite. Variegated mint-green leaves outlined in white erupt into bright coral when the new growth emerges in spring while dainty sprays of white bell-shaped flowers bloom freely over the plant. In fall, this evergreen plant sets its flower buds making it look all winter as though it were about to bloom. ‘Little Heath’ won’t tolerate poor drainage so plant it high and in amended soil. Grows 2-3 feet tall and wide, but also does very well in pots. Plant in part sun to light shade. 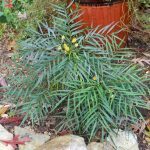 ‘Soft Caress’ Mahonia – Named the 2013 Plant of the Year at the world-famous Chelsea Flower Show, this charismatic evergreen features feathery foliage reminiscent of fern fronds, but with none of the thorn-like spines of other species. Bright yellow flower spikes top this drought tolerant plant in fall. Grows 3 feet tall and 4 feet wide. Plant in part to full shade. Tina Mast is Communications Director for Homewood Nursery in Raleigh, and can be reached at [email protected] or 919-847-0117.